Which hand would you rather 4-bet? Hehe, the image upload failed miserably...can't see the stack sizes so I'll write them next to each hand in the text. EP where he tightens up slightly to ~45%. He plays pretty straight forwardly on the river even though he likes to cb and barrel a lot flop-turn even in 3-way pots. His flop checks are honest and usually means x-f, but he likes to go for the x-r on turns with top2+ / straights when the spr is about 3-6.
in some more river bluffs than he used to. and fold. Villain (sb) does cb a fair bit in 3way 3b pots, and it feels like my hand particularly dislikes the bad relative position gets into a lot of marginal situations when we flop naked top pair or pair+GS. tendency to give up on the river (at least if it looks like your range is SDV-heavy and draws miss). Aggression by street: 36/41/22 but not a big sample though. He did just get stacked by sb maybe 5 hands ago, and seemed to ramp up the aggression after that. Sb seems to be a standard, not too creative reg. 3bets (not realizing that he would get 3-bet around 50% from most positions) and just playing passively overall. 3-4 times the last 8-10 hands. He showed down AA once when he 3b me btn vs mp, and showed some very speculative hands the two other times he 3b and went to showdown (don't remember the hands exactly, but hands that most people wouldn't include in a 15% 3b-range). He seemed to play ok post flop, and I didn't get any reliable reads. I remember he almost auto-cbet every 2-way pot though. 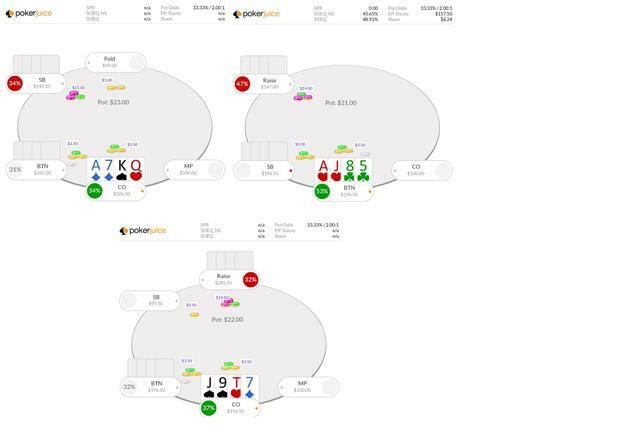 Btn is a sub-par lag who flats between 30-40% otb, plays pretty straight forwardly on the river, under-bluffs in general and likes to bet flop/turn merged and check back the river with a large fraction of his flop/turn cb-ranges. I have seen btn 4b in similar spots with AKJ5ss Jhigh suit, and AK53ds when a new player 3-bets a lot. Our hand plays better with poor relative position than the AKQ7ss in my opinion but the low suit may be difficult to play if we flop something like pair+FD or gutter+FD. The IP-player in this hand will not play as meekly and straight-forwardly as the fish in hand 1. Which (if any) hand would you 4-bet? Which hand would you rather 4-bet? some post flop reads. Just ask if you want more info on the players. Any input is welcome, GL!